In its very early stages, retinoblastoma causes a translucent red-gold glow that may be almost imperceptible and easily dismissed as a camera fault or trick of the light. If the eye has more than one tumour, you may see several small dots of white scattered around the pupil. When a child has retinoblastoma, leukocoria is not always seen in every photo. This depends on ambient lighting, the angle at which the flash enters the eye, the size and position of tumour(s), and whether red-eye reduction has been used. Similarly, if a child has cancer in both eyes, a single photo may catch leukocoria in only one eye. You can see this in the following three photos of the same child, who has bilateral retinoblastoma. The retina develops from the centre out. Infants with retinoblastoma often have very pronounced white pupil in photographs. The reflex can also often be seen in low light with the naked eye. This is because tumours in infants form in the central retina and are easily seen through the pupil when it is only a little dilated. 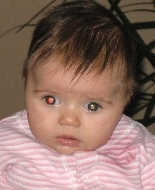 If a photo shows a large white reflection but all other photos are normal, this is unlikely to be retinoblastoma. Except in infants, tumours that cause a pronounced white pupil are usually very large and will most likely have been captured in previous photographs. An isolated bright white pupil is usually caused by normal optic disc reflection. However, a thorough eye exam is important to confirm the eyes are healthy. When tumours invade the central retina, or fill the whole eye, leukocoria can be seen with the naked eye in dim light. This is most common at dawn or dusk. The cancer may be very advanced at this stage, and a threat to the child’s life. An urgent eye exam is vital. In developing countries, most families do not have cameras to take regular photographs. Seeing white pupil with the naked eye is usually the first indication that something is wrong. This is why awareness about white pupil is imperative in developing countries. Remember that there are other causes of white pupil in children, such as coats’ disease, ocular albinism, severe refractive error and cataract. An eye exam is essential to rapidly rule out cancer and enable prompt treatment if an eye condition is present.